1. Keep the discussion on the current card. 2. Discuss the card within the context of Commander only. 3. Make comments that contribute: don't just say if a card is good or bad, explain your thoughts and experiences. 1 Pang Tong, "Young Phoenix"
Gotta keep RCotD going, so it's a new thread with the same game, and by my understanding, I'm basically obligated to do this for 2 years. I was considering picking the first card thematically, but then I clicked the random button and got the dragon queen of random cards, Intet. 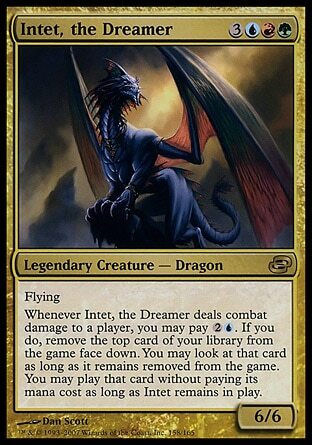 Back in the day, Intet was all over the place as the only Temur commander. I couldn't build an Intet deck because all the playgroups had enough Intet already... and then they printed Riku and Animar and poor Intet fell by the wayside (and into my waiting arms). My build of Intet played only lands, instants, and spells with flash so that the cards hidden underneath Intet would be as scary for my opponents as possible. Unfortunately, Intet has a horrible flaw: all you wanna do is hit people 100 times, but they're dead after 4 hits. 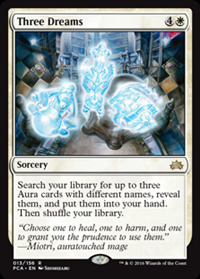 Not gonna lie, if Aether Meltdown was a card at the time, I might have played it on myself. Building a deck with her, and the general consensus I seem to be getting is, "load up the deck with goodstuffs". But I see other problems that I'm working with(chief among them what you describe, tstorm: I can only hit them 4 times each max. ); first, I need to filter my top deck so I don't whiff all the time. Second, I need stuff to ramp and get Intet out(not hard with green, I know), and while she's sitting back in the CZ, I need stuff I can hardcast. EDH decks: 1. RGWMayael's Big BeatsRETIRED! 3. URNiv's Wheeling and Dealing! She's pretty much the typical "goodstuff" commander. The other one in GUR being Riku. One warning: Don't play a land in your first main phase with her. You might whiff. Thank you for reviving the thread. My build of Intet played only lands, instants, and spells with flash so that the cards hidden underneath Intet would be as scary for my opponents as possible. 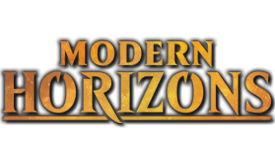 In Multiplayer you can add more hits with her, though with a good set up you only need one hit to end the game (not unusual to arrange multiple extra turn spells in a row, then use Reclaim/Noxious Revival type spells to repeat the process). I made my deck similar to yours, with instants in mind, especially ones with multiple functions and at least one "counter" effect like Cryptic Command, it turns Intet into a pseudo-Morphling, hard to kill and ends the game in a few hits. Intet is the embodiment of Ego (Red), Superego (Blue), and Id (Green), and she dreams, I love that design. I've given thought to building Intet a few times but never got around to it. She does seem like a great commander to play a Sensei's Divining Top in, also a great excuse to play my foil Crystal Ball. 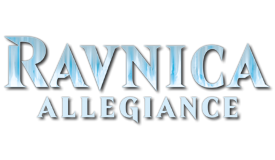 amazingly epic sig courtesy of DarkNightCavalier at Heroes of the Planes. The whole dead in just a few swipes is why my group has agreed that I don't have to track commander damage when playing Rakdos, Lord of Riots. As far as Intet herself actually goes my friend and I switched his Mayael for Intet and it turned out much better. The overall investment is better and the range of hits is much larger. Well, a 6/6 first strike for 4 is not bad value if you want to think of it that way, and I'm sure there's some shenanigans somewhere with the counter removal part. But the focal point of this card is probably that it's a dog that shoots bees out of its mouth. Are there good combos with this cycle at least? I didn’t think so...they just seem like beaters that need some help to get there. Hapatra only gets one snake out of Noxious, the GB one. Eh. Mirri, Cat Warrior counts as a Cat Warrior. Scarscale Ritual and Lethal Sting have cute interactions with the appropriately coloured ones, but that's not really a combo. Probably on the low end of the hatchlings for EDH. Paying 4 mana for a 2/2 first strike is just awful and the end result of a 6/6 first strike just isn't super impressive. I love -1/-1 counters, but four mana for a 2/2 as it comes into play is not a good ratio. Besides, even as a 6/6 first strike for four it'd still be a little behind on the utility department, and boros color hasn't enough ways to utilizes its counters, forcing an additional color onto the deck. I put it in my first Boros deck and I ended up removing it for something else after a few games. It was typically a 3/3 or 4/4 for 4 before eating removal or dying in combat. The only good thing about it is being super easy to cast. 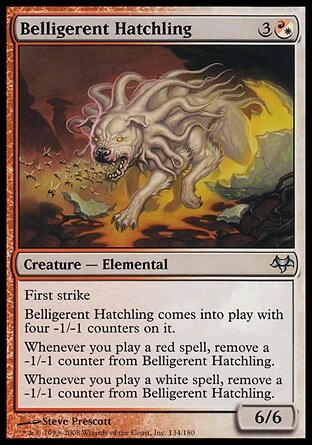 The full cycle includes Noxious Hatchling, Shrewd Hatchling, Sturdy Hatchling, and Voracious Hatchling. 6/10 If you want a cheap (relatively) beater, I suppose these'll work. They do have a nice interaction with the medallions and monuments, and the BG one even lets you remove two by just playing Deathrite Shaman. But most of the time, I'd rather just have Forgotten Ancient, Quirion Dryad, or Titania's Chosen to do the same thing better. Synergy with Doubling Season: There is no way these guys have synergy with Doubling Season. 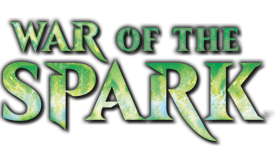 The noxious one also has wither, so it makes snakes with hapatra when it does damage, and it has other synergies as well as there are other ways to utilize the counters (like quillspike, as I have the quillspike/devoted druid combo wombo in the deck, and the spike can get slamming big easily even without it. 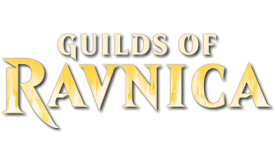 Flourishing defenses is another, it makes elves). This dude? He's just too weak. He doesn't synergize with anything. He looks baller though. A pitbull displacer beast that breathes bees. "Oh yeah, what are you gonna do? Release the dogs? Or the bees? Or the dogs with bees in their mouth and when they bark they shoot bees at you?" Anyway, I can't say I'm too impressed from a casual perspective. The end payoff isn't that great, and a 2/2 for 4 CMC gives me the 'bleahs' too. Look, another general I've used! 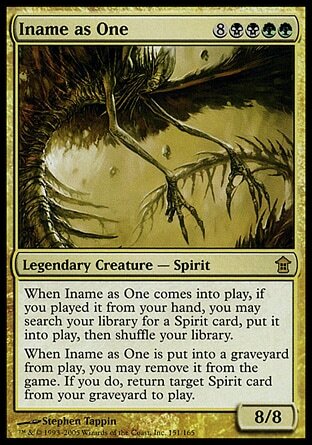 Iname as One has two very cool tribal abilities, one to tutor for a spirit and another to reanimate one. Unfortunately, the first ability only triggers if you cast it from your hand, which is pretty bad from the command zone. And then the second ability only resolves if you actually exile Iname, so that doesn't work with the command zone either. Iname is basically a vanilla 8/8 unless you start doing nonsense like Sacrifice it and return it to you hand, and after all that you've payed 16 mana for an 8/8 and 1 spirit from your library. My Iname deck wasn't terrible though, cause it turns out that if you have the mana and interactions to actually trigger Iname you also have the resources to win the game with the other 99 cards you're playing. Story time: I lent that deck to a friend, I think I remember the details of this right. Shortly after a board wipe, he ended up with a board of lands, Iname, and Liliana of the Dark Realms at 6. He activates her -3 to pump Iname 4 for the swamps in play. I'm perplexed because +4/+4 seems way worse than the ultimate, but also because I'd never not used that -3 as a kill spell and had to reread the card. On my turn, I do some stuff and play a blocker. 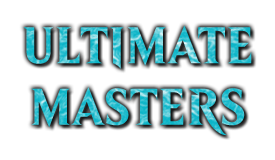 Pass back to him, he uses the minus ability again to kill my blocker, E-witnesses Liliana, recasts her, ticks down to pump again, and swings for the kill. Never saw that one coming. Command Beacon to get it into your hands, and BG is the best to tutor the Beacon. Can’t you exile it, and then it goes to the general zone instead? Or does doing that negate Iname’s ability? Anyway, it seems like more hoops to jump through than it is worth. You can choose to exile it to its ability and then choose to go to command zone instead, but then the ability asks the "if you do" part and knows you didn't actually exile it. Per rule 117.12, "if you do" really means "if you choose to pay the cost". It works fine, even though exiling was replaced with something else. 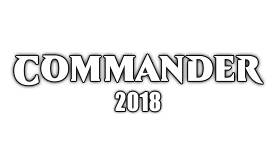 Putting your commander into your command zone is a replacement effect. Therefore if you choose to put Iname into thw cammand zone when it dies you do not get its death trigger AT ALL. So you're never given the option to exile it at all. Cool card, has won me a game in my 5 color spirits tribal deck. Unfortunately, it sits in my hand more often than it helps. I once saw someone flashing this in to play Iname, Death Aspect from their library in response to another player casting Living Death. Sadly it was the only time I saw it being played. This card simply has way too many restrictions and high mana cost to be useful.